On a warm spring day Peony rockii (Gansu Mudan Peonies) fills the garden with a wonderful perfume, it is easy care and will flower in part shade. So lets learn a little more about this great plant pick. 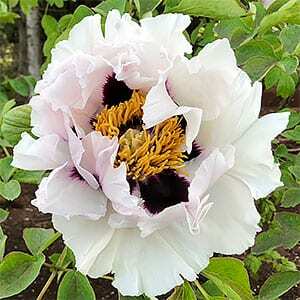 Paeonia rockii or ‘Rocks Peony’ is a tree peony variety from the Gansu province in northwest China. It was first recorded by Joseph Rock, and today is widely used in hybridisation. With many hybrids and cultivars are available for sale the distinguishing factor is the dark purple flare at the base of each petal. They also happen to be a peony with excellent fragrance, strong growing and disease resistant. In their natural environment they have been know to reach 3 metres (9ft) plus inn height with a similar spread. The species is usually described as white flowering, semi double with deep purple flares. Fully double varieties are available are are pink and yellow flowering cultivars, all with the trademark flares. Peony rockii do like a well drained humus rich soil, much the same as other peonies, they differ in that they will flower in part shade, and in fact grow best in light afternoon shade. In very hot positions, they can tend to lose their foliage earlier in summer and go into dormancy. Choose a position with some protection from the heat of the afternoon sun. Dig in good amounts of compost and aged cow manure. Plant at the same depth the plant was in its container. Water in dry spring or winter periods to ensure good flower size. Fertilise with chicken manure or cow manure at the end of each winter and renew the mulch.